To help with the process of customizing your user's experience, Pup includes a User Settings convention that allows both you and individual users to manage their settings. Settings for users are stored in two places: the UserSettings collection, which acts as the "master" list for all settings in the app and on each individual user—in an array called settings—in the Meteor.users collection. Settings for each user are stored as a single object in the user's settings array. Each setting stored on the user has a schema that's identical to the "master" setting in the UserSettings collection. For administrators of the application (users with the role admin applied), user settings can be managed when viewing individual users via the /admin/users page. Learn more about the users admin page here. For non-adminstrative users looking to manage their own settings, these can be accessed via the user's /profile page. While new settings can be added via the admin GUI described below, when you first deploy your application, you may want to seed your UserSettings collection with a set of default settings. By default, Pup includes a file for helping with this located at /startup/server/accounts/userSettings.js. This file is only intended to add settings in bulk to a new deployment. It should NOT serve as an alternative way to add new settings to users (meaning, do not expect this file to add each of the default settings to your existing user base). Automatically, when new users sign up for your app, they current state of the UserSettings collection will be copied over to that user's settings array. So, if you have five settings globally in UserSettings, those five settings will be applied to each new user that signs up. This behavior can be customized or removed in /startup/server/accounts/onCreateUser.js. value: 'false', // Pass a string and allow schema to convert to a Boolean for us. 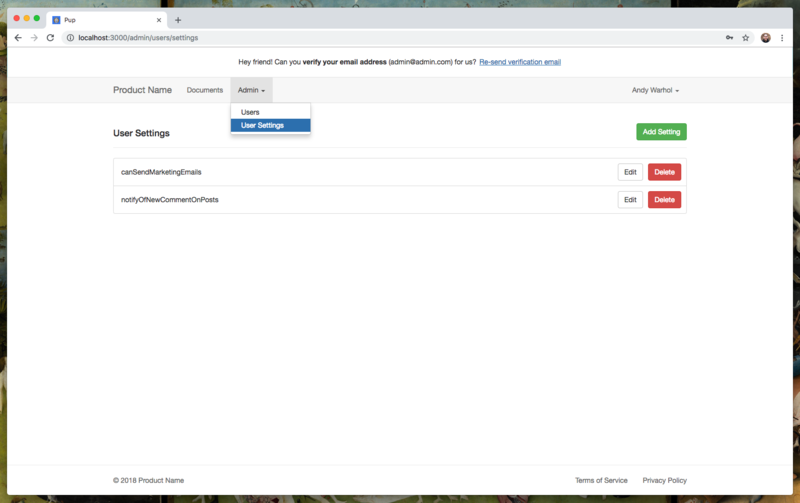 To make creating, editing, and deleting settings easier, Pup ships with an admin panel for managing user settings via a GUI. User Settings admin panel in Pup. For users in the admin role, this page can be accessed in the app at /admin/users/settings. New and existing settings can be created and edited via a modal on the same page. Settings can also be deleted from the same page. Adding User Settings in Pup. 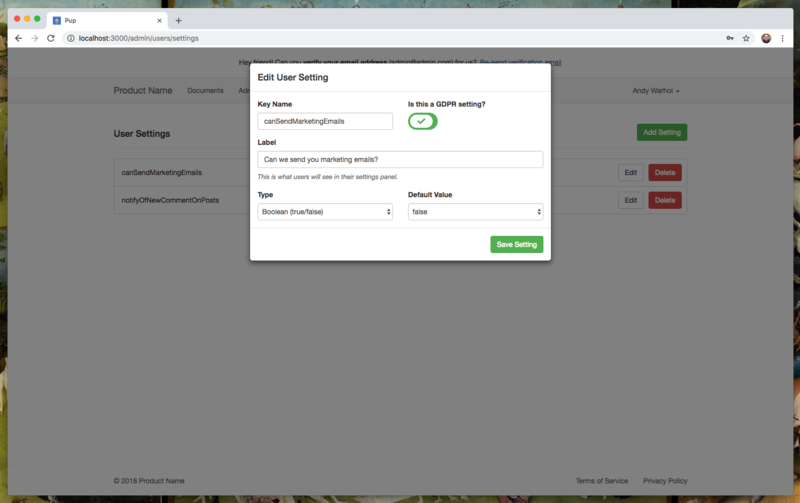 When creating a new setting, Pup stores the setting in the UserSettings collection in MongoDB and adds the setting to each user's settings field on their Meteor.users record. A similar workflow is followed for editing existing settings—the UserSettings collection is updated and then all users with that setting—as well as deleting settings (the setting is removed from all users and then removed from the UserSettings collection). Heads up: When you edit a user setting we will intentionally overwrite that setting for the user, meaning the default value you set will be applied for that user. Editing User Settings in Pup. Though Pup includes a GUI for managing settings, it is your responsibility for wiring up new settings that you add to your UI. This also includes making sure to remove settings from your UI before you delete them so they do not break rendering. Although user settings can always be read directly from a user's settings array, to simplify this process, Pup includes a module called getUserSetting() which helps you to retrieve individual settings for a user. The module can be passed three arguments: the name of the setting key that you'd like to retrieve for the user, whether or not you'd like the valueOnly returned (as opposed to the entire setting object), and optionally, a userId that isn't the currently logged in user (if you're retrieving a setting as an admin, this can come in handy). As an example, on the right, we showcase using the getUserSetting() module which can be imported from /modules/getUserSetting.js to retrieve the GDPR-related canSendMarketingEmails setting highlighted in the examples above. // Send the user an email. // Example of returning a value from a mutation resolver for GraphQL. // Here we return an array of all the userIds that were emailed.